Things got a little rowdy on your last night in (insert location here). What was meant as a farewell toast transformed into a memorable, though fuzzy evening, and with daylight imminent, you frenetically pack your bags, hand over cash for the room you called home, and sprint to make the train time scribbled on the back of your hand. Breathing that sigh of relief when you claim your seat, heavy bags safely stowed, you dig into your luggage to check the time on your phone. You packed your phone, right? That sense of hopeless and impending doom that rides in with the realization that an important belonging has been lost is not a pleasant one. Sadly, it is a feeling that many travelers become acquainted with at least once throughout their journeys. That's where Backpack Boomerang comes in, a team of seasoned backpackers whose mission is to reunite wandering travelers with their belongings that have wandered away. The method is simple: if you've lost an item, head to their website and click on the ” losers”? tab, fill in a few pertinent details about it and yourself, and wait patiently for a response. Likewise, if you've found an item, the ” finders”? page asks that you do the same. The network currently operates in Thailand only, but the creators hope to expand throughout the Southeast Asian region, and then the world. Of course, success is dependent on equal support from finders, as well as losers, but the grassroots concept is one that should appeal to the friendly disposition of the average traveler. 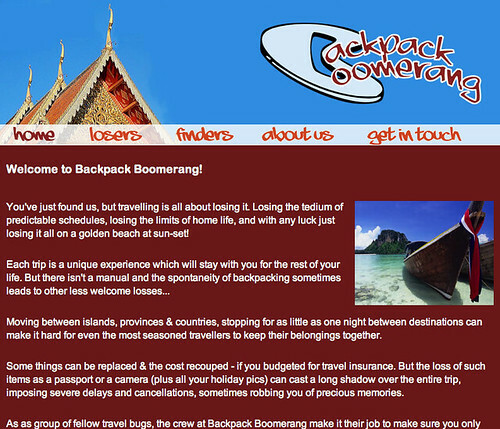 Backpack Boomerang isn't there to take away precious pennies or force any signatures; they're simply providing a new way to connect one backpacker to another, all while keeping our possessions in the right hands. So, travelers, we're curious. Chime in: have you lost an irreplaceable belonging on one of your excursions? Share your tale of woe, and next time, perhaps Backpack Boomerang can lend a hand.